The Huawei Honor 6X is a powerful, well-designed smartphone that can do a lot in spite of its $250 price tag. It comes equipped with a 5.5-inch display, multiple rear cameras, and a metal finish with rounded edges. It feels like a classy, modern flagship, too, one that won’t look out of place beside the iPhone 7, Galaxy S7, and Huawei’s Mate 9. Naturally, you’ll want to keep the device in good condition until your next upgrade, and the best way to do so is to pair it with a case. The 6X is a relatively new phone — meaning there aren’t a ton of quality cases available just yet — but we’ve managed to find a few offerings that will properly safeguard your new phone. 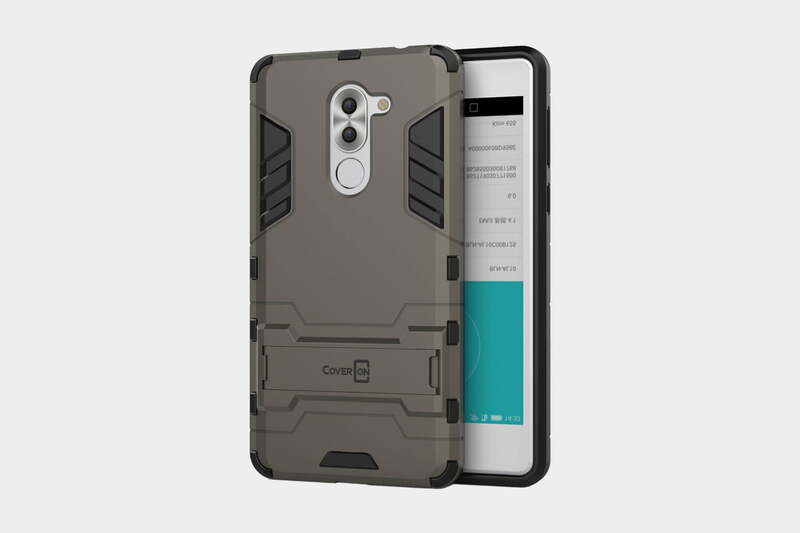 This is a simple TPU case that will fit snugly around your 6X. It’s designed to provide better grip, and the finish will keep fingerprints from appearing along the back and sides. The case also covers the side buttons on your 6X, and a pattern found in the interior will help protect your phone against minor falls and shock. The case comes in three colors — blue, black, and red — and each variation has a metallic finish, as well as carbon fiber textures along the top and bottom for an added touch of style. If you’ve ever used a CoverON case before, you know what you’re getting into. The most notable feature is the built-in kickstand, which can be used to prop up your 6X and allows you to use your smartphone hands-free. The soft, inner bumper and corners help thwart potential impacts, too, and the outer shell reduces scratching and retains the sleek feel of your phone. The textured side grips also add a bit of bulk and make the phone easier to hold onto, though only slightly. This is a case puts protection at the forefront, but, thankfully, it doesn’t neglect style completely. The wide array of color options see to that. Omoton’s offering is a transparent case that features either gray or rose gold edges. Like other clear cases, it’s largely meant for those who like the original design of their phone, but want to add some amount of protection to it. It’s slimmer than the previous two cases on our list, yes, but it does work to prevent scratches, dents, and other blemishes. The dual-layer case is flexible, making it easy to apply and remove, but it fits snugly, so it won’t separate from your phone if dropped. There are also cut-outs for your phone’s ports, camera, fingerprint scanner, and speakers, The side buttons are covered to keep them intact and functional. It doesn’t do anything incredibly unique or break the mold when it comes to case design, but, nonetheless, Tudia’s offering is a solid choice for the 6X. It’s a case you can’t go wrong with unless you don’t like black, gray, mint, or rose gold color schemes. The case features a dual-layer design, meaning it consists of a soft interior and a hard outer plate. This pairing of materials protects your phone from scratches and keeps it from rattling when dropped. The raised edges will also keep the 6X’s display from making contact when placed face down, and it’s designed to work will all compatible screen protectors, so your phone should be well protected if you opt for the latter. The case ensures access to all your phone’s ports, too, and the button covers are nicely spaced apart and labeled, so you can easily identify which button is which. Nillkin forwent the smooth, sleek design of other cases, in favor of a matte finish for this 6X case. This particular design choice renders the phone easier to grip and leaves it less susceptible to fingerprints and oil smudges. The case is also dust-resistant, but if any dust does make its way onto the case, it’s easy to clean. Nilkin’s case is also comfortable to touch and elegant to look at, but there isn’t much when it comes to options or variations, as it only comes in black. The minimal case also leaves the top of the 6X exposed, so if you’re looking into cases because you’re prone to dropping or fumbling your device, we recommend looking elsewhere.